Jack O'Connor's quivering blobs of protoplasm (human beings) get all sorts of whacky ideas that don't easily go away, one being quite impossible. We like to think there is such a thing as knock-down power but physics tells us that if we were to actually knock down an animal our guns would knock us down with about the same force. It's ridiculous, but magnumitis can be a rough disease to shake. The standard U.S. Military round for several years, the .45-70 Government, was responsible in large measure for eradication of both the American Bison and the grizzly bear from North America in a few short years. It fired a 405 grain .458 diameter bullet at 1305 fps and has always been tremendously effective on game. Buffalo Bill's favorite gun was named Lucretia Borgia. It was a .48 caliber Springfield Trapdoor, the gun that William Cody killed 4,250 buffalo with in one year, or 4,862 buffalo in eighteen months for the Union Pacific railroad along with deer and antelope. Cody claimed some 40,000 buffalo in his career, not all of them with Lucretia Borgia, but most of them. A slower round yet, Lucretia Borgia threw a 470 grain conical pushed by 70 grains of blackpowder. 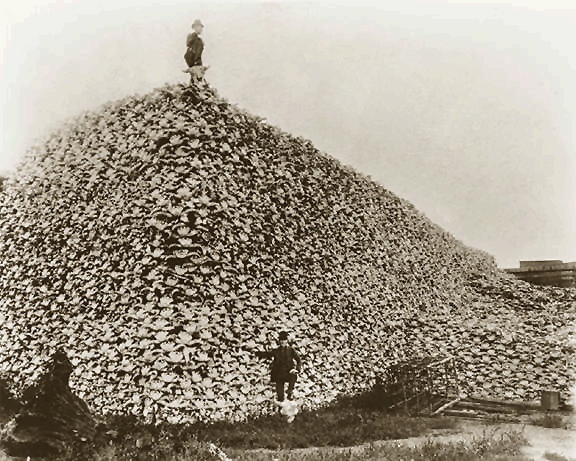 Above, a pile of American Bison skulls from 1875. Most of these animals fell to the .45-70 Government round that was introduced in 1873. The full name of the cartridge was ".45-70-405," moving a 405 grain bullet pushed by 70 grains in weight of organic blackpowder at 1305 fps. In the late 1990's, Ian McMurchy conducted a series of hot and cold tests with a variety of inline .50 caliber muzzleloaders, firing 100 grains by volume of Pyrodex RS pushing a saboted 300 grain Hornady XTP. With 209 shotshell primer ignition, 72 degrees F. muzzle velocities averaged 1610 fps, while his -15 degrees F. velocities averaged 1567 fps. Other tests were conducted using 300 grain saboted bullets and 100 grains by volume of different propellants. 100 grains of Goex FFG averaged 1468 fps, Goex Clear Shot averaged 1404 fps, ARCO averaged 1384 fps, and Quick Shots averaged 1233 fps. The highest velocity recorded in this series of tests was 1594 fps by 100 grains of volume of Pyrodex P.
A 100 grain volumetric charge has always been considered a full-powered hunting load out of inlines ever since the 1980s launched the renewed interest in muzzleloading hunting. With black powder and 300 grain sabots, it has historically been in the 1500 fps area. This load has taken a tremendous amount of game in the last twenty years, to make a dramatic understatement. How much Blackhorn 209? Suit yourself, but 80 grains by volume is more than sufficient for most applications, and ballistically superior to 100 grains of blackpowder, Pyrodex, or Pyrodex pellets. Today, I'm often asked how much powder? When my answer is 80 grains or so by volume of Blackhorn 209, more then a few people seem puzzled. Don't we need magnum loads to take a deer at 100 yards? Well, not hardly. We never did. There has yet to be any substitute for good shot placement that I know of. What of this 80 grain charge of Blackhorn 209, anyway? An 80 grain volumetric charge of Blackhorn 209 pushes a 300 grain saboted bullet at 1650 to 1680 fps muzzle velocity, contingent on specific muzzleloader and precise bullet/sabot combination. That's 10% faster than a 100 grain blackpowder charge of Goex FFG and faster than 100 grains of Pyrodex RS or Pyrodex P. Unless you think that the countless millions of deer, elk, and black bear that have fallen to 100 grains of blackpowder or Pyrodex over the years is just coincidence, 80 grains by volume of Blackhorn 209 is more than adequate for any of these to 150 yards or so. If your muzzleloader kicks you well, you're the one that loaded it so you can make it kick you if you really want to. It won't make anything deader better inside 150 yards, but if you look hard enough for recoil I suspect you'll be able to find it. 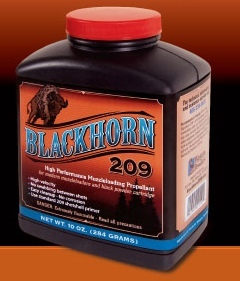 One hundred grains of Blackhorn 209 is an ideal load for most hunting ranges and applications. That ups your muzzle velocity to 1850  1890 fps with a 300 grain sabot, 1900  1930 fps with a 250 grain sabot. Most deer, regardless of firearm, are taken inside 100 yards, inside 50 yards in many areas. Ironically, I hear a few folks carping about propellant costs. Well, if you want to increase your powder costs by 50%, that's easy. Just up your powder charge from 80 to 120 grains. It is almost like burning your money. In most cases, it is exactly like burning your money, and you're the one that decided to burn it. Once we understand that 80 grains of Blackhorn 209 by volume is not just equal, but ballistically superior to 100 grains of blackpowder, Pyrodex, and Pyrodex pellets we might not be quite as quick to burn it without purpose. A smooth, comfortable, repeatably accurate load wins every time. It is one of the obvious benefits versus the take two pellets and call me in the morning type of thinking. That's no way to work up a load; it isn't load development at all. Loose powder allows you to easily dial in your muzzleloader to the velocity, accuracy, and shooting comfort levels you prefer. That's a huge advantage. 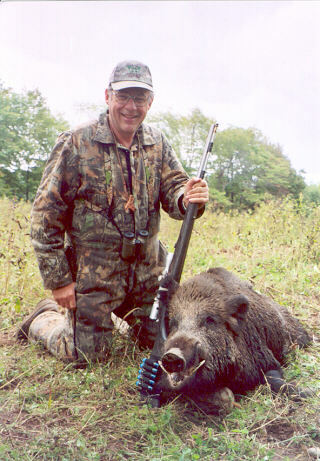 I have a few reasons for suggesting that 90-100 grains of Blackhorn is often the ideal load. Here are just a couple of them. 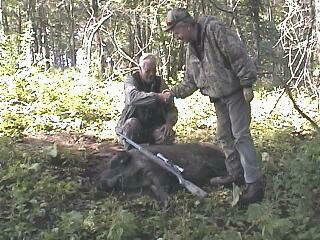 Above, congratulating my buddy Chuck Fish on the instant drop of his boar. Chuck used 92.5 grains of Pyrodex P.
What a fine set of teeth! 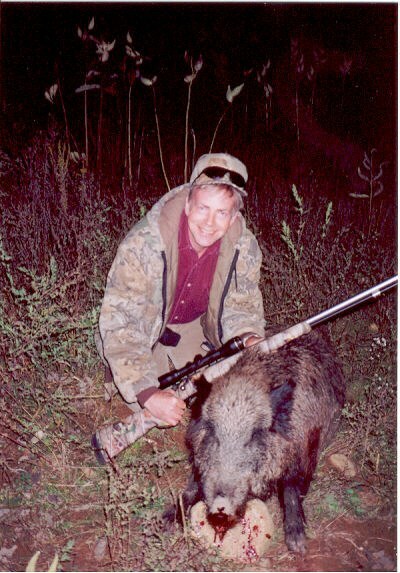 No, not Doc White, I was referring to Doc's Russian boar, taken with 90 grains of Pyrodex P.
I took this boar running at 140 yards. It was one shot using 100 grains of powder. 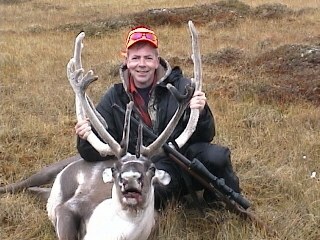 Caribou at 175 yards? 100 grains of powder. 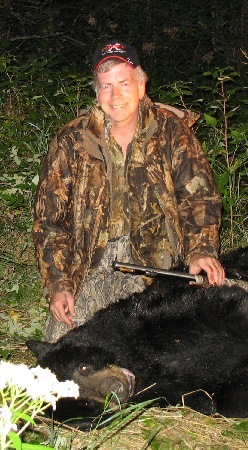 One shot, one bear: 100 grains by volume Blackhorn 209. 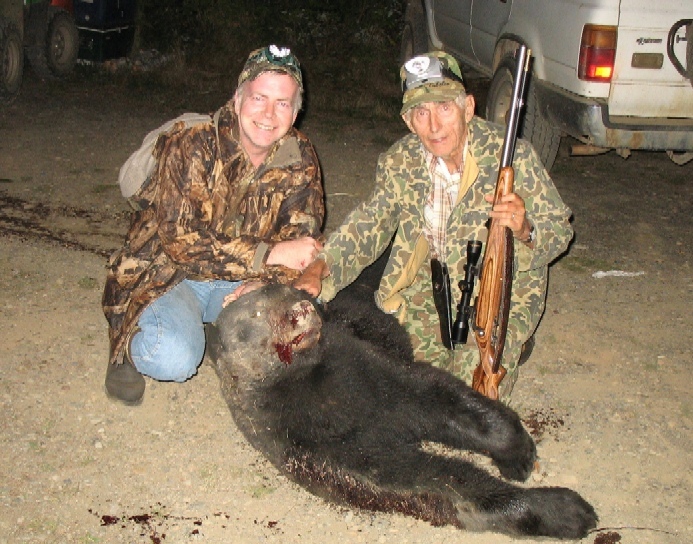 Dad's bear from this year: 100 grains by volume Blackhorn 209 and one shot. The "Deer Room" must have been a typo. 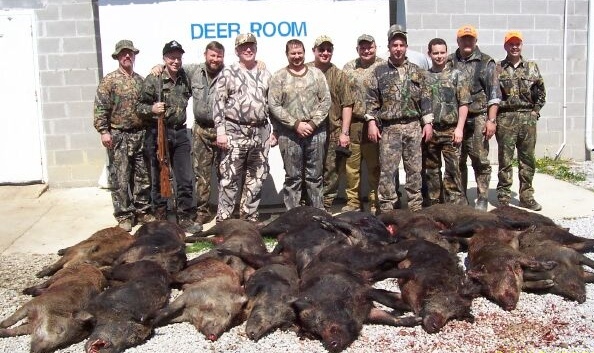 It was sixteen hogs by 11 AM that day, mostly taken with 90 - 100 grains of powder, or less.